We offer a full line of polymer feed systems designed to meet the ever changing demands of water and waste water applications. Having solutions for batch make-down and feed, in-line continuous, and on-demand systems, we can provide you a customized solution for all your dewatering needs. The DCS will feed solution, emulsion and dispersant polymers, whether they are cationic, anionic, or non-ionic. By providing initial high shear mixing, followed with additional aging, the DCS will develop even the most difficult polymers to their fullest dewatering potential online!! Standard units are Nema 4X rated. Explosion proof or custom applications are available upon request. With neat polymer feed rates up to 10 gph, water flow rates to 30 gpm and pressure feed rates to 100 psi, the DCS series has the polymer feeder for your application. An integrated equipment package shall be provided to automatically meter water and liquid polymers, blend them and feed it to a water stream for flocculation. Mixer chamber shall be powered by 1/2 hp direct-drive motor. Belt drive and static mixers shall not be acceptable. The mixing chamber shall be of metal construction to endure pressures up to 100 psi. The polymer pump shall be of plastic/acrylic construction. After leaving the mixing chamber, the polymer solution shall never again be subjected to shear which would degrade the hydrated polymer. After the mixing chamber, the solution shall feed into a ten (10) gallon aging chamber. Water-train components shall include: Rotometer flow indicator with integral flow adjusting valve. All electrical enclosures shall be Nema 4X. Any rotating motors shall be TEFC. Warranty shall be at least one-year, and shall not be voided by exposure to rain or other gently falling water. Electrical requirements: Ordinary 3 prong plug, 110VAC, max 10 amps, 60Hz. The DCS-MD series of polymer feeders have make-down cabability. By utilizing the same activation process utilized in our DCS feeders the DCS-MD offers the versatility found only in batch feed systems. 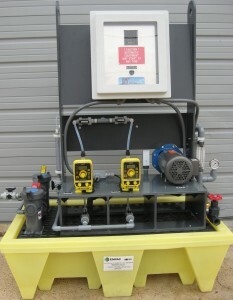 Batch feed applications are desirable where high pressure, high volume, or additional aging is required (some anionics). With neat polymer feed rates up to 50 gph, solution polymer feed rates to 100 gpm, and feed pressure to 3000 psi the custom build DCS-MD series offers the versatility needed for the most demanding polymer feed applications. The DS series of polymer feeders are designed for low feed applications where economy is important. By incorporating static design, the DS series is excellent for clarifiers, oil separators, small DAF units, or any application where low flow rates prohibit the use of expensive feed equipment. The DS series is the most economical and efficient polymer feeder on the market today. Maximum feed rates are 2 gph neat polymer 10 gpm of water. An integrated equipment package shall be provided to automatically meter water and liquid polymers blend them and feed it to a water stream for flocculation. Mixer chamber shall utilize static mixers. Motorized mixers shall not be acceptable. The mixing chamber shall be of PVC construction to endure pressures up to 100 psi. The polymer pump shall be of plastic/acrylic construction. Electrical requirements: Ordinary 3 prong plug, 110VAC, max 5 amps, 60Hz.